Part 1 - What is accreditation? Dr. Bradley Olsen will discuss not only what the AACD accreditation process is but he also reviews reasons why you would want to do it. 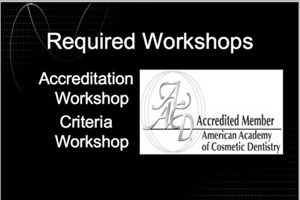 Resources such as the Guide to Accreditation Criteria, AACD Journal of Cosmetic Dentistry, AACD Website/Credentialing staff will be reviewed. Case type one discussion continued and case type two, one or two indirect restorations, case type three, tooth replacement, case type four, anterior direct resin and case type five, six or more direct resin veneers will be reviewed. Dr. Bradley Olson discusses how to find the best patients for AACD Accreditation case submission. Dr. Olson will review examples of each case type and share what the examiners are looking for. Dr. Weston will discuss case selection for the AACD type 1 accreditation case and demonstrate a mock up. Dr. Weston discusses how to deliver maximum results using minimal preparation techniques.